Black arrows indicate the amount and direction of motion measured by GPS stations in HVO’s monitoring network during the October 2015 slow slip event. Arrow lengths correspond to the amount of motion at each station (see scale at bottom of map); arrow points show the direction the stations moved. Color indicates topography, from sea level (green) to 4,000 feet elevation (brown). The ocean is shown in blue. USGS graphic. Today’s Volcano Watch begins with a question: Can you guess when the next slow slip event will happen on Kīlauea Volcano’s South Flank? As a hint, the last one was in October 2015, and before then, events occurred in May 2012, February 2010, and June 2007. If this seems like a pattern, you’re right. What is a “slow slip event” anyway? Slow slip events are sometimes called “slow earthquakes” or “episodic slip events.” They happen when a fault begins sliding, just like in a regular earthquake, but so slowly that it takes several days to finish instead of several seconds. At Kīlauea, slow earthquakes occur on the nearly flat-lying décollement fault that underlies the volcano’s south flank at a depth of 6‒8 km (4‒5 mi). This is the same fault that was responsible for the magnitude-7.7 Kalapana earthquake in 1975. However, slow earthquakes produce no seismic waves and, therefore, none of the damaging shaking of a regular earthquake. Because of this, we actually look forward to them! 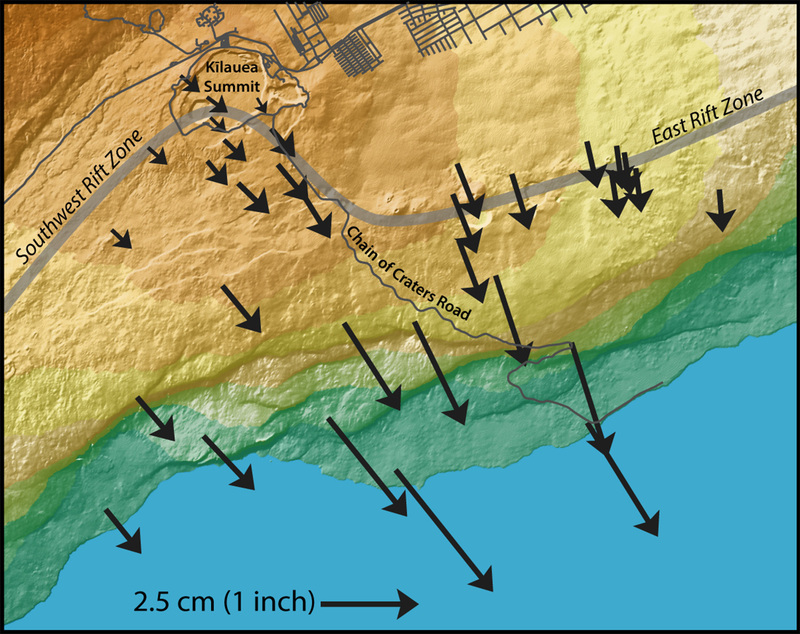 They help relieve a small amount of stress on the fault and give us a view into frictional properties of this hazardous fault beneath Kīlauea. During a slow earthquake, the south flank surges seaward by an additional amount, usually about 3 cm (1.2 in). This additional motion occurs over 2‒3 days, and is about the same amount that would happen in a regular magnitude-6 earthquake. Kīlauea slow slip events tend to occur evenly in time; in particular, events after 2005 have occurred every 2.5 years, give or take 3 months. They are also caused by slip on the same section of the fault every time and tend to be about the same size. In fact, Kīlauea slow slip events are examples of so-called “characteristic” earthquakes—a series of several earthquakes of similar magnitude and location, which indicates that they are breaking the exact same part of the fault again and again. According to the “characteristic earthquake hypothesis,” this series should continue into the future, allowing scientists to forecast the time, location, and size of a future earthquake. The characteristic earthquake hypothesis was originally developed in hope that it could predict regular, and possibly damaging, earthquakes. This idea emerged from observations of a series of earthquakes that seemed to strike about every 22 years near the town of Parkfield, California. After earthquakes in 1857, 1881, 1901, 1922, 1934, and 1966, all of which occurred as magnitude-6 events in the same part of the San Andreas fault, scientists predicted the next earthquake would occur in 1988. As it turned out, the next Parkfield earthquake did not occur until 2004, 16 years after the predicted date. However, even though the characteristic earthquake hypothesis wasn’t successful at predicting a regular earthquake, it has been useful for forecasting the occurrence of slow slip events around the world. Locations where recurring, predictable slow slip events happen include the Cascadia Subduction zone offshore of Washington and Oregon. This fault produces slow slip events equivalent to a magnitude-6.7 earthquake every 15 months. In Japan, on the subduction zone along the Nankai Trough, major slow slip events occur approximately every 7 years and are equivalent to magnitude-7 earthquakes! Because the most recent slow slip event on Kīlauea happened in October 2015, and the events have a recurrence time of 2.5 years (give or take 3 months), we can forecast that the next one might occur between now and August 2018. But remember, there won’t be any shaking or other effect that could be easily felt by individuals. We’ll be keeping our eyes on HVO’s monitoring networks to know when the next slow slip event happens on Kīlauea, and you’re invited to keep an eye on HVO’s website for updated information (volcanoes.usgs.gov/hvo/).